This chilled Southwestern Quinoa Salad is the perfect (easy) recipe! If you are just starting on your Clean-Eating journey, check out this post: How to start eating clean. In an effort to eat a healthy diet and enjoy lots of different recipes, I am CONSTANTLY scouring Pinterest for new Clean Eating Recipes. I have ended up becoming quite the fan of quinoa and now make it multiple times per month. Quinoa is a great gluten-free option and packs a lot of punch with all 9 essential amino acids! Does it contain lots of protein, fiber, and iron…what’s not to love? I love any kind of Mexican or Southwestern food so when you combine that with quinoa, I’m SOLD and I think you will be too! This recipe is perfect for spring/summer weather because it’s light, chilled and leaves you feeling satisfied but not too full. 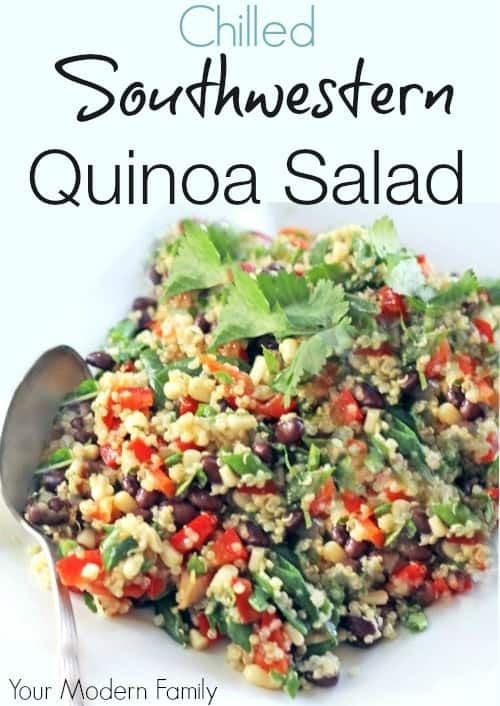 I hope you enjoy this healthy recipe for Southwestern Quinoa Salad as much as I do. Cook quinoa as directed on package. Once the quinoa is completely cooked, fluff the quinoa with a fork and set it aside to cool. 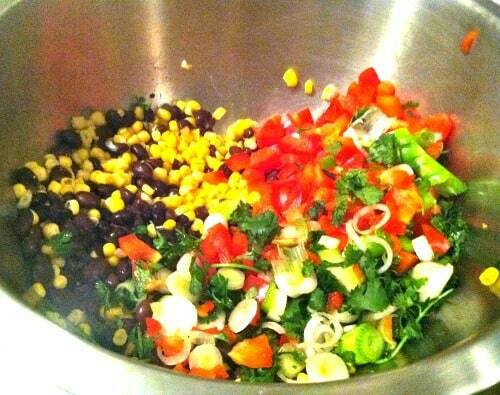 Drain the black beans and the corn in a colander and rinse thoroughly with cold water. Pat dry with a paper towel and pour the beans and corn into a large bowl. Add chopped orange bell pepper, sliced grape tomatoes, sliced scallions, and chopped cilantro. In a small bowl, whisk together the olive oil, lime juice, black pepper, garlic powder, and chili powder. Pour the dressing over the salad, and toss well. Add the cooled quinoa to the salad and toss well, making sure that the salad is evenly coated with the dressing. Season to taste with additional black pepper, garlic powder, or chili powder. Heather of My Life Well Loved: a healthy lifestyle blogger married to my love, Eric. We’ve been married 8 years and I love him so much! We had our first baby last year and I’m chronicling my entry into motherhood with Leyton Samuel. I work in social media and also teach at Pure Barre. Filed Under: Kid Friendly Recipes, menu plan, Staying Healthy! This sounds so wonderful! I am going to have to try it! Today I think! I’m curious how many servings this is supposed to make as well. I have made this twice now, and it is delicious! So fresh and healthy, and I love that there are leftovers for lunches. I add chopped avocado, and next time I’ll add a little sriracha to the dressing for some spice.